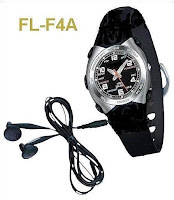 Spy gadgets are usually designed for police investigations or for the private investigation business. Usually, users of these spy gadgets are retired law enforcers or ex – military officials and sometimes, civilians that undergo a special training for this type of investigation. They are the ones who become Private Investigators. But, not all people can afford to hire a private investigator. So our genius surveillance researchers have come up with this new batch of spy gadgets that were aimed to be user friendly. The trend now in the surveillance industry is to make gadgets that are user friendly. Their mission now is to bring spy gadgets closer to every normal civilian who needs to investigate something but don’t have the capability to hire a private investigator. Here are some gadgets that anyone, including you, can buy. This mobile phone software can be used to track personal calls and message logs. It also has GPS Tracking System, SIM change detection and you can actually hear live phone calls through this. This software is very flexible because of its many features. You can use it by installing this software to the targeted phone and that’s it. You’re now an instant spy. This camera has its own features of 1/3 inch CMOS, 60 deg angular field of view and 3Lux illuminations. It also has automatic white balance, 48db S/N ratio, 5 to 35 deg of transmission operation, video resolution of 882 x 240 at 30fps, backlight compensation and 2412Mhz transmission frequency. Do you know what it means? It only means that it is a camera tailor-made for spying purposes. Every second of the target’s transparent activity will be clearly captured. It has a 64MB memory capacity and a 2GB SD/MMC Card. It also has the capability to record MP3 audio at 32-320 Kbps bit rate. 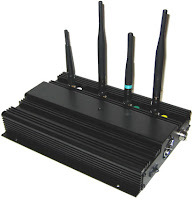 This type of gadget can mess up a wireless phone's signal. So with this capability, it can temporarily remove the ability of a phone to call or even send a message. With this, you can prevent your chatty neighbors from giving out your secrets to the entire neighborhood or prevent communications of your family members with someone you do not want them to talk to. This simple watch is best used to record conversations with clear quality. It has a multistage equalizer to make that happen. Besides spying, you can also use this as a MP3 Player for listening to music. 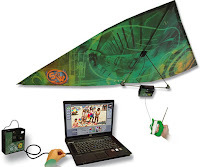 This is a wind flyer that has a digital camera attached on the frame and is capable of taking photographs from air. It is made up of fiber glass and comes with a wireless remote control that enables you to take photographs while your own feet are on the ground; best for aerial surveillance. 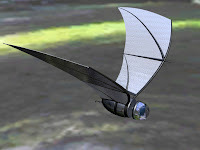 Another form of aerial surveillance, aside from the Spy Kite, is this six-inch robotic spy plane modeled after a bat. It can send information like smell, sound and photographs to its operator. COM-BAT looks like it is designed to have power hunting potential. Its best feature is that it can get recharged through sunlight and wind. 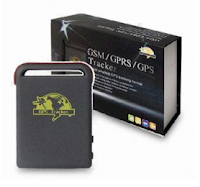 This tracker uses a GPS tracking system to locate itself. It has an accuracy of 2.5 meters, so you won’t have any problem about its precision. You can track this gadget through internet because it works with Google Earth. This gadget also records the time, date and location of movements. It has 2 LED indicators, one for GPS lock and the other for battery charge. Akhilesh Sharma maintains and writes Tweak And Trick. He is a technology enthusiast and a science student. You can contact him at tweakandtrick@gmail.com. Protect your private information by storing it in a password protected folder for free. Watch an ASCII version of Star Wars in Windows using the command prompt. Some tips and advice to help you increase your computer's speed. Make your computer welcome you in its computerized voice just like in the movies. © TweakAndTrick 2010 - 2018. All Rights Reserved.